This photograph was sent to us by one of our regular contributors who asked for help in identifying its location. It depicts a group of bathers, and was purportedly taken in Brighton sometime in the 1930s. Our researchers examined the image and decided it was probably reversed. The reason for their conclusion was that the writing on a sign apparently in the shot was aligned on the wrong side. You will see that we have provided both the original and reversed image for comparison. Where is the railway track? Initially, our researchers considered the photograph may have been taken near to the Banjo Groyne, more correctly called Paston Place Groyne, at the foot of Duke’s Mound. The lamp standards are certainly consistent with those that were fitted in that area. However, if this were the Banjo Groyne, it would have been very difficult to avoid capturing the railway and the car sheds at Paston Place Station in the scene. The level of the shingle has increased dramatically over the years, such that the Volks railway tracks, which were originally built upon pylons, now sit directly upon the shingle. This makes it impossible to try to replicate the view with a modern photograph which might have aided identification. We would like to know if any of our visitors can suggest where this picture might have been taken from. If you think you know the location, please give as many details as possible in a comment below. Perhaps a swimming club or sporty organization of some kind? The men look very middle class – the sort that went on to fly Spitfires in the War. Maybe they are an Olympic team from that era! I think the original is correct and looking east. Behind the signs on the left you can just make out the slope of Dukes Mound Road. The railway sheds at Paston Place would be a little to the left, just out of view. I downloaded the photos and looked at them in large view. The text on the sign is aligned to the left which is usual. It would be unusual to align it to the right. The top word appears to be “Warning”. I would suggest on this basis that the reversed image is in fact the correct view. And the sign is to warn about the Volks railway. Therefore I suggest that the photo was taken looking west towards the Palace pier. I agree that looking west toward Paston Groyne is most likely. An aerial view shows the Volks railway crossing the groyne at an angle. Hence the likelihood of a warning sign either for train drivers or pedestrians. The shingle almost reaches the top of the groyne these days. I am very confident that looking east is correct, please check and you can see the slope of Duke’s Mound Road. The railway track on the west side was at beach level, on the east side it went on a viaduct because the beach was much lower. I have a photo of the east side 1931, I will add a page shortly to show it! Would that be the Banjo Groyne behind the swimmers/ bathers? Hi Peter, good point, well made… it is possible to see Dukes Mound Rd. You are correct, it is looking east. The chimneys on the skyline must be on Chichester Terrace etc. I think Peter is correct–the blond chap on the far left in the first picture is probably right-handed, and would therefore be far more likely to have a parting on the left side of his head. I think the photo was taken looking towards the east. My reasoning for this is the roofing and and chimneys of the houses are similar to the ones on Chichester Terrace today; the path winding its way through the bushes on Dukes Mound can just be made out; there is little shingle build up, meaning the sea wall is visible, the groynes along this stretch are attached to the sea wall, meaning they would appear almost as tall as the Banjo Groyne. The last reason is the shingle angle to the sand, long shore drift always builds the pebbles on the west side of the Brighton groynes, so I think the camera was pointing east. There is yet another reason why its looking east and not west! If it were looking west where has the colonnade gone, surely its roof and the upper walkway would be visible? Also missing is the electric lift, above the Concorde! Final point, nothing to do with direction, dont they all look so happy, little do they know what is just round the corner in 1939! The men are probably all in their 20’s, I wonder what happened to them as war broke out? Did they survive to marry their sweetheart and raise a family, or did they pay the ultimate sacrifice? Another factor in support of reversal is a probable wedding ring on the finger of the fourth person from left, back row, original picture. Regards, Andy. I am most grateful to Jennifer for publishing my beach photo and for all the interesting comments it has received so far. I do feel however, that my original text that accompanied the photo should now be published as an additional comment as it was never my intention to create a mystery/ conundrum. My only thoughts were it would be nice to share with the good folk of MyB&H an interesting old Brighton beach photo taken in a more leisurely era. However, doubt was cast that the photo was not of Brighton and the image had been altered in some way (reversed). This photo is the best part of 80 years old taken sometime in the 1930s the location is almost certainly the Dukes Mound end of Madeira Drive looking east but I’m not sure about the background and angle of the image that seems to play tricks with the eye. The pebble beaches were not so built then compared with today, it looks like low tide and is that the Banjo Groyne behind the person paddling? The man standing forth from right is my Father. The tall man standing on the far left is Pop Hemsley who for many years was a well known teacher at Woodingdean CPS. Several of the people in the group were members of the Shivers swimming club. Eighty years ago the groups bathing costumes would have been the latest fashion however, it all looks very quaint in 2013. Its very noticeable that the ladies in the group are standing at the back, in those more male chauvinistic times that would have been normal maybe? The very cool looking lady in the hooped top would not look out of place on Brighton beach today. Perhaps she is making a statement for female equality? (I say good for her). The first photograph has quite obviously been printed the wrong way up, ie; emulsion side uppermost. The only way to prove this would be to have sight of the original negative. However, speaking as a ‘Brighton Boy’ who spent many hours on those very beaches I would suggest that this photo was taken on a beach a couple of groynes to the east of the Banjo Groyne south of Chichester Place looking westwards towards the pier which is hidden behind the groynes. Don’t forget that the colonnade starts well beyond the junction of Duke’s Mound and Madeira Drive so the lift, and the clock (missing now) would be out of sight. As previously stated above the footpath in the bushes below Duke’s Mound can be made out quite well. I also agree with Andy’s view that the lady would have worn her wedding or engagement ring on her left hand, also the chap on the shore end has a ball in his right hand. The writing on the sign being aligned to the left in the lower photo would also appear to be correct. I have tried to make out the wording on this and from local knowledge would guess that it says something like, – ‘Warning, Electric trains crossing’, or similar. Furthermore, in those far off days the beach was much lower than it is today which is why the railway track is not visible as it is behind and below the post and wire fencing. Camera lens angles are very subjective; The photographer got in the frame what he (or she) wanted in their picture but it’s a shame the background is so faded or out of focus as it is often what is in the background that is of interest to us many years later. Isn’t the Shiverers Swimming Club still going? Perhaps try comparing it with another photo of your dad Chris. It is good that you do know who some of the people are and thanks for sharing it. Love this image, thank you to my Uncle for posting it, and the gentleman fourth from the right is my Grandad. Really lovely to see photos of my Grandad when he was younger and it gives a brief insight into a bygone era, how carefree and happy everyone looked! And what a lovely clear photo for the 1930s! 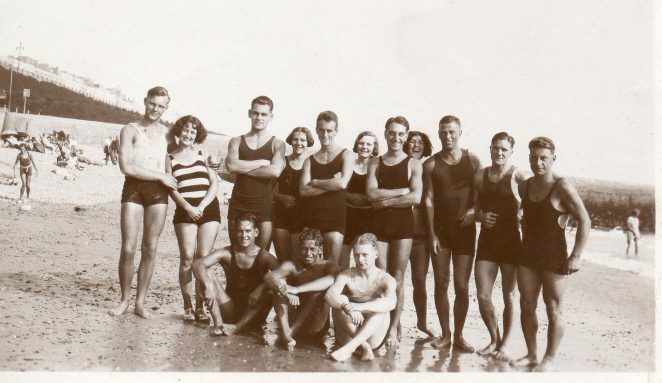 How very different this group of young folk look with their neat parted hair and smart bathing suits, compared to the young men and women of today – the young chaps look very fit and muscular in this image compared to today’s youngsters who spend their spare time on computer games! Also if this was an image from today, the young ladies would have far more flesh exposed and perhaps a tattoo or two! Its a shame the mystery of the photo has over shadowed the subject matter, but worth noting that it was common in the early days of photography for the person printing the photograph to pick up the negative upside down, thus reversing the print. All photographs at that time were printed using a manual enlarger. (Ironically, nowadays many photos of rare surf spots are reversed in surf magazines to hide their locations!) I will dig through my Father’s photo album, it will be interesting to see if he has any photos corresponding to this one! Thanks once more for posting this super photo! I think the reversed image is correct and looking west, wording on the sign etc. To my eye the original image just does not ‘look right’ either. I think you are all missing the point that Peter has made some time back. If you examine the photo in detail, behind the 2 signs on the left can be seen “Dukes Mound Road”; its very clear. Furthermore if you save the photo and open with Paintshop and change the effects, the road stands out a mile! Therefore it just can’t be looking west, it has to be looking east. I am in the “East looking” camp, and agree with Michael Brittain’s good point about the longshore drift. I also agree with others about the Dukes Mound road running eastwards (as it does) in the original photo. I am absolutely certain that photo No.1 (original) is the true image! and as far as I know this photo has never been intentionally altered. It clearly shows (as previously mentioned) the Dukes Mound Road as a line through the bushes and correctly rising from west to east (surely this is not a foot path). However, photo No. 2 the (reversed) image, obviously shows the Dukes Mound Road – rising in the opposite direction from east to west, which is of course nonsensical. I therefore agree with Stefan, Peter, Ian, Michael and Eddie. The image was captured with the camera facing east or to be more precise North East. As Eddie Powell comments it’s very clear. What everyone seems not to have mentioned is the time of day the photo may have been taken? Image No.1 (original) with the camera facing east shows a short shadow on the left cast by the group which seems to indicate the shot was taken sometime in the afternoon, reflections of some of the group’s legs in the wet sand are also visible. If image No.2 (reversed) were to be true with the camera facing west then surely the photo would have been taken much earlier in the day and the group’s shadow would be longer with the sun still rising in the south east, also would there have been that many people on the beach? With due respect to all those looking west – I too am joining the “east looking” camp. Hi Robert. I did look at the position of the sun and even looked at the calendars for sun positions and tidal charts to see whether any information could be gleaned from them. Unfortunately, as the sun is in the southern hemisphere whichever way round you view the print, all that can be deduced is that it was either taken in the morning or conversely in the afternoon. The length of shadow is a characteristic of the elevation of the sun in the sky and the angle of the shadow a characteristic of the compass bearing of the sun. Broadly speaking, the sun would always be to the south and would cast a shadow even at midday. Go an hour or two either side of that and the shadow would be of roughly equal length, whichever way you are. It proves absolutely nothing unless you actually know the time of day the picture was taken, whatever orientation the picture is. Andy, you are making it far more complicated than it really is! It’s looking east towards Dukes Mound, which can be clearly seen, top left on the original. Now Watson, what else can we deduce from the photo? I suggest that the photo was taken in the afternoon, with the sun in the south-west and the shadow towards the north-east. If the “reversed” were to be correct, which it isn’t, then the photo was taken in the morning, which it wasn’t! Now Watson, be a good fellow and pass me my pipe! I still say the first picture is correct. The people look natural, whereas in the second shot they appear awkward, and it gives the impression that they are falling into the sea. I think the photographer composed the shot reasonably carefully even though it was into the sun (using a large aperture on the camera), and the original picture seems balanced as a result. Mind you, it might have been a black and white print from a colour positive – but perhaps we had better not go there! Hi Peter. I regret I am completely unconvinced and have studied the photograph at length from both directions. The feature you see and refer to is certainly not Duke’s Mound, which was denuded of vegetation below the ramp as far as the next groyne eastwards, as it still is today. The Kemp Town slopes to the east are a far more likely contender and run down to the beach in both directions. As to the Banjo Groyne, look at the tide mark and draw a line through it. As water is level, tilt the photo to make the line horizontal. This clearly shows the groyne top is angled into the sea. The Banjo Groyne top is completely level as it was a landing platform for ‘Daddy Long-legs’. Furthermore the relative height of the tide on the side of the groyne comes up far too high in comparison with other contemporary photos of the Banjo Groyne. My own inclination was that numerous pieces of evidence (which you simply dismiss) indicate the photo was reversed. I believe it was probably taken between the second and third groynes to the east of the Banjo Groyne (which are now buried under shingle), somewhere opposite where Chichester Place emerges. Contemporary photos I have sent to Chris fully support these premises and my own conclusions are drawn solely from what can factually be proven, not that which has been based only on supposition. I have not given a previous opinion because Chris has already made his mind up and there is therefore no point in perpetuating the debate. However your remarks really do call for a response, if only to give others a sense of balance in the debate. Chris Wrapson’s well-intentioned gesture of making this splendid group photo available on the site has backfired with a vengeance! He no doubt wishes he had never made this particular contribution. Still, debate is healthy, they say, and has certainly exercised our minds. I thought it would be interesting to distil the thinking so far: a count-up reveals that the ‘pro West’ camp has 3 supporters (there were 4 but one ‘defected’ to the East) and the ‘pro East’ camp has 8; that’s including my own vote, which I hereby publish! I have the names and dates but do check for yourselves and correct me if I’m wrong. I would say to anyone that believes this is taken from the west of the Banjo Groyne looking east, go on google street view. You can actually place yourself on the end of the groyne. Now look east and look at Duke’s Mound. If you believe that is what is shown in the picture, which was purportedly taken even further to the west, the likelihood of this supposition becomes obvious. While some have a central parting, the majority of the men in the top (original) photo have their hair parted on the left. Was this normal in those days, as it was later on? If so, that would point to an east-facing photo. Women do not only wear wedding rings, so the ring in the photo could have been worn on the right hand, not necessarily the left. The man standing fourth from the right no matter which photo you look at, who happens to be Chris’s father, bucks the trend! I wonder if Chris has other photos of him which could prove once and for all which photo is correct! Over to you Chris please. Hi Alan Thanks for placing the ball back in my court – Most thoughtful of you.Unfortunately the only other photos I have of my father in that era he is wearing his favourite Trilby hat or Army beret. I do have lots of photos of him in later life but by then he was sporting a much wider hair parting – if you know what I mean! I have sent copies to Jennifer for her and Andy’s perusal. I do hope dear old Andy Grant will take this new evidence seriously and not simply cast it into the Wilderness. Hi Andy, I think you have a point there, well up to a point you do! Checking on Google I think you are correct that it cant be Banjo Groyne, however its still looking east. I now think that it is just to the east of Banjo Groyne, and still looking east, with the slope of Dukes Mound Road on the left! Probably the groyne in the background is one that you mention is now burried! I have recently caught up with this. All of you on the East side are right. All on the west side are wrong! This is a photo of my Grandad Wrapson and his chums. I remember Grandad showing me this picture amongst others and talking to me about it. I clearly remember him telling me where it was taken, which was just east of the Banjo Groyne with Dukes Mound in the back ground. Also those of you getting all scientific, the natural why to stand when on a slope is as in the original. After this photo was taken, Grandad Wrapson would no doubt have taken himself up to one of the many pubs (walking up the slop next to Dukes Mound) to play the piano, entertaining the good people of Kemp Town. He was a very talented pianist!! I have just shown the photo to my 96-year-old father. He’s not in the photo but he did swim at Bango Groyne 1933-38. He pointed out Chichester Terrace and remembers everything clearly. Please contact me (adrianthai2011@bigpond.com) maybe he can help. Thank you for the photo, taken at the “Banjo Groyne” of the group of bathers enjoying the sunshine. It so happens that both my mother and aunt appear in it (centre in black swimsuits). Their names were Dora and Maudie Holman, and were both members of “Brighton Ladies Swimming Club” from early childhood until they passed away in their 90s. My mother was a diver and also taught diving at North Road Baths, and Maudie (Ottaway) was secretary of the “Brighton Ladies Swimming Club” all her life. They both were A.S.A. officials and swimming was so precious to them both. My father, Jim Blyth, was secretary of the “Brighton Swimming Club” and that is how my parents met. 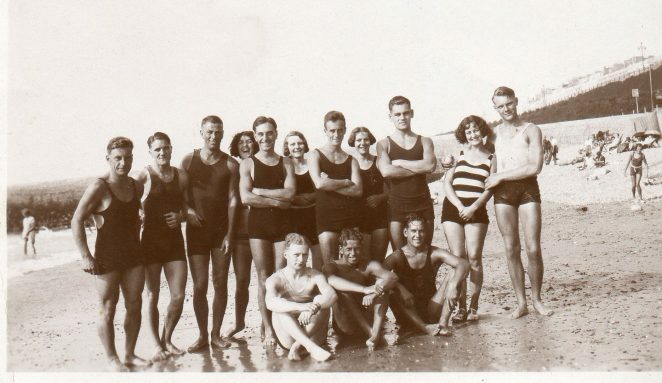 Over the years I have looked at this beach photo (taken in the 1930s) of my Father and his pals many times and often wondered about their names and what became of them. I wonder how many of the group survived WWII, it would be nice to think they all did. The original and true photo has my Father ‘Jack Wrapson’ standing fourth from right. On the far left standing with the lady in the hooped top is my old Woodingdean CPS teacher ‘Donald (Pop) Hemsley’ Pam. Many thanks for your post its great that we now have two more names, your Mother and Aunt look very alike, were they twins My Father was also a lifelong swimmer he past away in 1979 aged 73 years. I’ve just found this photo of which I have several similar! The people I know of worked locally and the group would meet at lunch times.They were known to themselves as ‘the brownies’. I believe that the man extreme left with the woman in the hooped costume is Leonard Acton, with Marie. Third man from the left is my father, Bertie Boast and I think the laughing woman (fourth woman from left) is my mother Pat. Man at far right is Arthur Sharp. The date is more likely to have been mid-late 1920s.